Milwaukee has indeed made good on their promise to join DeWalt in entering the hand tool market under their power-tool-famous brand, and one of their new products even made it into our Favorites of 2011 list. This drywall saw caught my attention as well as a potential replacement for my Husky 5-in-1 drywall tool. Honestly, I hate the Husky, except for one thing: it works. It’s ugly, it’s awkward, and it looks like a Swiss Army knife designed for a two-year-old. But it does a great job of making accurate holes in drywall, so it gets a good bit of use around my house. But when I sit down and really think about it, I spend probably 80% of my time with the Husky using the saw and the rasp. Considering that I have at least a dozen utility knives around the house, maybe a saw/rasp combination makes more sense. Of course, each rasp style offers some advantages. The Milwaukee’s narrow rasp will work much better for adjusting hole shape in tiny amounts or for quickly widening a small hole. The Husky’s wide, flat rasp does a great job of straightening out long cuts, but is way too big to fit into smaller holes. So in the end, maybe I just need both. Expect to pay around $10 for these in stores. In the short run, I think I’ll pick one up to toss in my household tool caddy. In the long run, I think I’ll end up ditching the 5-in-1 for a good jab saw, a nice long/flat rasp, and a quality utility knife. I like the Marshalltown 6″ drywall saw, Stanley Surform pocket plane, and FatMax Xtreme or Stanley 199 fixed blade utility knife. 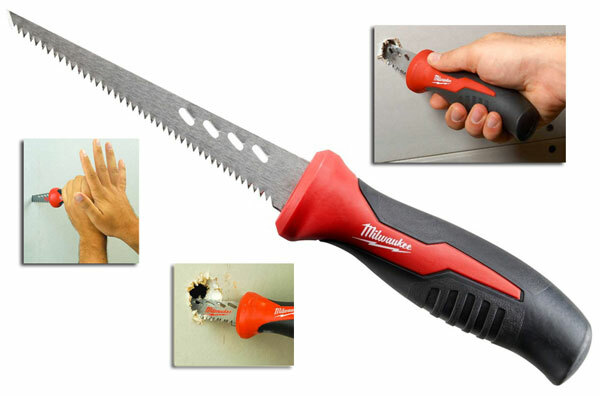 The handle of the Milwaukee is similar to one used for a folding handsaw accepting reciprocating saw blades. Very comfortable! For $10, I think I can afford to try one. But I think that rasp is just an added gimmick. I generally haven’t been disappointed by Milwaukee though. Personally, I think the Stanley FatMax at Depot set the standard a few years ago. I tried the Klein which looked almost identical (probably made in the same factory) and it did not hold up as well. Forget the Husky version, it was too aggressive and wore out to fast. Have not tried the Milwaukee but I agree with the earlier post that the rasp seems too small to be functional. Made in China, I suppose? Personally, I don’t like this.. its very untidy to use this… it really makes a lot of mess to my wall..